I battled to connect with the characters whose lives on paper lacked depth, so I didn’t feel the emotional impact of their fate. This is crazy for me as I am probably one of the most sensitive readers, frequently sobbing over characters and ruining the pages of my books. The Decker element is also repetitive, explained over and over, and detracts from the characters personal stories. I liked the interaction of Mateo and Rufus’s friends throughout the story, but the periphery characters and they way they interweave through their last day seems contrived and, unlike their friends, ultimately didn’t add anything to the story. This is my first Adam Silvera read and I am underwhelmed. I gather from the outpouring of love on Social Media that mine is not a popular opinion *ducks*, and I am glad the book is well-loved by most even if it didn’t work out for me. I will definitely try another one of his books. Any recommendations? On a positive note; I love the personal note from Adam Silvera preceding the story giving perspective to the book – I wish more authors did this. 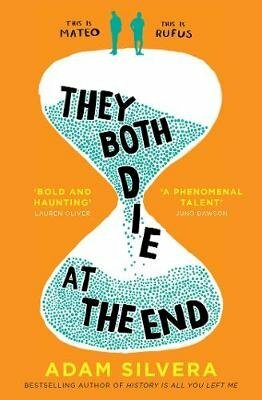 Full review: http://crushingcinders.com/they-both-die-at-the-end I was voluntarily provided a complimentary review copy by the publisher.